This new development of 28 units brings affordable passive housing to the Isle of Wight, bolstering the island’s bold eco ambitions while embracing a traditional seaside aesthetic. The Isle of Wight is a pretty rural island, and preserving its attractive environment is important to residents, not least because it helps to bring in the island’s many tourists. However, for a number of years now the island’s environmental ambitions have been global as well as local. In 2008, the Isle of Wight Council signed up to the ambition for the island to have the lowest carbon footprint in England by 2020. When Southern Housing decided to redevelop a 1.5 acre site on the island to create new and much needed affordable homes, the council translated words to action by giving fi nancial support to enable the landlord to build the homes to the passive house standard. Southern Housing had always wanted to use a fabric-first approach for the 16 houses and 12 apartments, because the approach offers high environmental performance while also benefi ting residents by giving them signifi cant and long-term savings on their energy bills. However Southern Housing was also aware of the Zero Carbon Hub’s reviews into the real-life performance of low energy buildings. 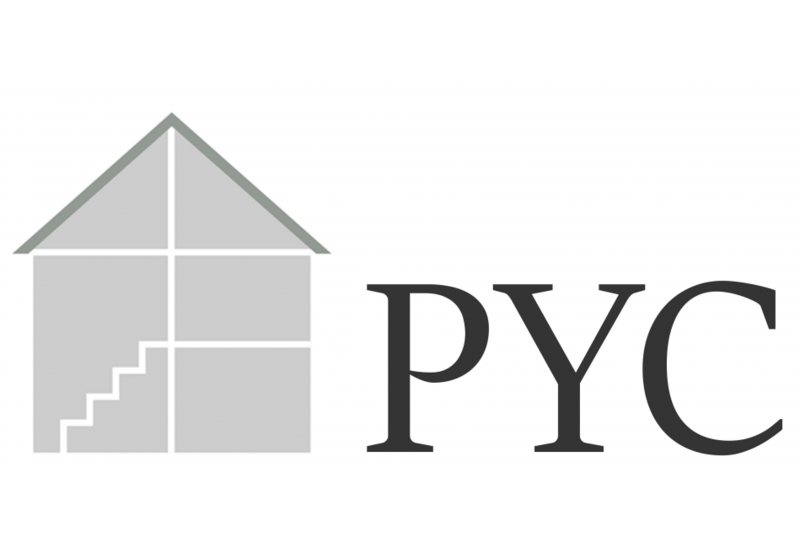 “In terms of their energy use, air quality and thermal comfort, these reviews found that the benefi ts of the design intended didn’t appear,” Southern Housing development manager Andrew Hulmes explains. Passive house was chosen to avoid this performance gap, and ensure that residents would have running costs that were genuinely low. Passive house also removed the need to provide expensive renewable technology to meet sustainability goals. Local authorities often encourage — sometimes even require — communal heating using CHP or biomass in larger schemes, but Southern Housing were clear that they wanted the fabric to do the work. As Andrew Hulmes explains: “Doubts about the use of micro-renewable energy technologies had arisen. Based on our experience, high management costs around central boiler systems neutralise any energy efficiency savings. The new development still needed to respect the rural surroundings however – even though some of these considerations complicated the drive to slash heat demand and achieve passive house. The forms of the individual buildings are not as simple as they could have been, featuring double-pitch roofs and flat-roofed sections: “The mass of the houses is broken into smaller elements to fit the scale of the surrounding buildings,” Andrew Ogorzalek explains. 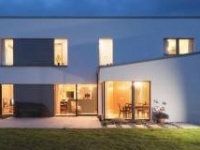 There is no doubt that a form like this makes achieving passive house more challenging than a terrace, or even than semi-detached houses with a more simple form, and PCKO worked closely with passive house consultants Warm to ensure the energy targets were met. However the architects’ original intention was preserved through the iterations. Parsons continues: “The houses vary from a form factor of 3.2 to 3.7; these figures are certainly far from what we’d usually aim for, but we were working within quite a specific design aesthetic that the architects felt to be appropriate for the location. Parsons adds that although they did not have the benefit of PHPP9 for this design, it might have made the design easier — Warm have found the new software really helpful on another scheme involving small units with high occupancy, as is characteristic of social housing in the UK. The Cameron Close units feature cathedral roofs, with skylights over the stairwells, bringing in extra natural light to help save on electricity and provide rapid purge ventilation in hot weather. Skylights over stairwells are not always popular with contractors, who will have to be working at height over a void. However the team from Stoneham Construction, who carried out the build, took it in their stride. “It’s fiddly, because you end up with a scaffold tower that’s then in everyone else’s way, but it isn’t difficult,” says site manager Nigel Meaden. At Cameron Close, the units are constructed from thin-joint blockwork, an option chosen by the contractor. Fortunately external insulation with render was not a planning issue in this instance because the island has quite a characteristic ‘sea-sidey’ aesthetic, with little exposed brickwork. “There is an accelerant in the mortar which means you can lay more courses at a time. The mortar goes off in 15 minutes so you can just keep building, and are not restricted to a particular amount in a day. Although the overall glazing on the houses is not the kind of extravagant overheating-waiting- to-happen seen in some high budget builds, the risk of overheating from summer solar gains did have to be carefully considered, not least because the Isle of Wight is one of the sunniest places in the UK. The windows are quite tall, and this makes it harder to shade them effectively with brise soleil – they would have had to be about one metre deep to be effective, which was not realistic. Instead the design team opted for sliding shutters. “Shutters brought their own complications; there is a risk of thermal bridging with mountings, and as they were inset to lie flush with the render, there is less insulation behind them – there’s always something to think about,” says Karl Parsons. It remains to be seen whether the residents use the shutters as intended. 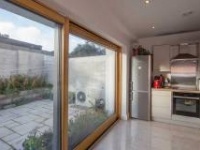 In other passive house projects it has been observed that shutters are sometimes used more for privacy than for summer shading; if left closed during the heating season this would tend to hinder rather than help the thermal performance by blocking out winter solar gains. However Warm are remaining involved post-occupancy, to carry out monitoring for Southern Housing, who want to find out how much energy residents are using, and explore how this fabric-first approach can be replicated in future schemes. Warm have already run staff sessions for the maintenance and customer care teams, introducing them to passive house, and in particular explaining how to use the MVHR. Excluding infrastructure, external works and prelims, the build came in at £1,333 per square metre. 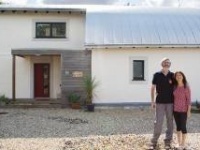 There was an estimated additional capital cost of about 7% (about £10,000 per unit) that related directly to passive house, which was covered by the Isle of Wight Council. Southern Housing says these figures represent a 9% increase over Code 4 and 20% over England’s building regulations: “Cameron Close was always going to be built to a higher specification, even before we decided to build to the passive house standard,” Andrew Hulmes explains. The result is something that everyone is very pleased with. “The quality of the homes is very high due to the attention to detail given both to passive house design and construction,” Hulmes says. The development is now part certified, with the remainder pending. “At one extreme, passive house developments can be driven by cost-effective compliance with the passive house standard — depending on their vision, this may require significant compromise from the architect. Building type: 16 semi-detached houses in eight pairs and one block of 12 fl ats. Specific performance data is for numbers 12 & 13. Thermal bridging: Details developed to minimise thermal bridging, concentrating on critical junctions and window installations. Thin joint blockwork with external insulation used in order to provide a continuous wrap of insulation. Marmox Thermoblock used to minimise thermal bridging at party wall, internal wall and the perimeter. Compacfoam used to optimise door thresholds and to provide a thermal break at shutter bracket mounting points. 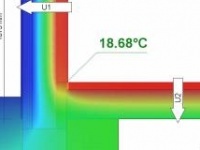 Therm modelling used extensively to evaluate design options. Walls: Wetherby external insulation system Rendered 230mm Kingspan Kooltherm K5 insulation on 200mm Celcon Thin-Joint block, with a parge coat internally and plasterboard fi nish over a services cavity. U-value: 0.076 W/m2K. Where external shutters are fi tted the insulation drops to 150mm, with a resultant U-value of 0.108 W/m2K. Roof: The main roof construction consists of fi bre cement slates on timber rafters, with 600mm Rockwool insulation at ceiling level, a taped plywood airtightness barrier and services voids under, with a plasterboard finish. U-value: 0.066 W/m2K. Cathedral roofs use the same roof finish, but with 150mm Kingspan Kooltherm K7 between the rafters, 50mm Kingspan Kooltherm K18 below the rafters, and a plasterboard finish. U-value 0.144 W/m2K. Flat roofs consist of a single ply membrane over Kingspan Thermataper TT47 insulation tapered to achieve a 1:60 fall, over an 18mm plywood deck on 219mm Easijoists forming a services void, with a plasterboard finish. U-value of 0.107 W/m2K. Windows: Munster Joinery Passiv Aluclad windows and Internorm KF410 (with P2 Foam) doors, all triple glazed. Fakro FTT U6 triple glazed roof lights. Overall glazing U-value of 0.84 W/m2K. Heating system: Vaillant EcoTec Plus 824 condensing gas combi boiler with wet radiator system. Ventilation: Zehnder Comfoair 200 MVHR system, Passive House Institute certified as 92% efficient. Effective heat recovery efficiency as installed 86%. We specialise in low energy solutions for high performance buildings.